Wildfires are increasingly commonplace across much of the western United States, with catastrophic consequences to not only the landscape but to the people living through them. Photo courtesy of ISU GIS TreC. For land managers across the western United States, the task of drafting postfire recovery planning has become daunting as the number of wildfires has increased. Agency land managers, who are responsible for the stewardship of public lands, ensure that natural disasters such as wildfires do not cause permanent or long-term loss of the benefits from affected ecosystems. Once a wildfire has been contained, a land manager assigned to the fire typically has two weeks to complete a postfire rehabilitation plan. This plan includes details about the fire and how the ecosystem will be rehabilitated or returned to its prefire condition. It takes into account the effects of the fire on wildlife habitat; water quality; and endangered, threatened, or sensitive species that may be present, as well as economic and social considerations, and a host of other site-specific factors. The plan is ultimately approved by the governing agency. Typically, land managers can spend as many as 4 of the 14 allotted days locating and acquiring the data necessary to assess the fire's impact and develop a good plan. While each fire is unique, the key to addressing many of the critical questions faced by land managers is geospatial in nature. Often the necessary geospatial data is scattered across various data centers and stored in a variety of projections and formats. Keith T. Weber, GIS director at Idaho State University (ISU) in Pocatello, Idaho, and John L. Schnase of the National Aeronautics and Space Administration (NASA) Goddard Space Flight Center in Greenbelt, Maryland, believed ready-to-use geospatial web services could be leveraged to create a system that quickly organized critical fire-specific data and made that data conveniently available to the land managers dealing with the aftermath of wildfires. Weber and Schnase had previously worked together on smaller projects that studied the use of satellite data to monitor postfire rehabilitation. The RECOVER automated response process. (1) An instance of the RECOVER decision support system deployed in the Amazon Elastic Compute Cloud (EC2). 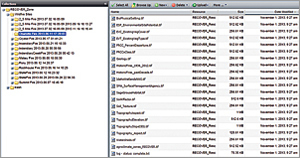 (2) The RECOVER Server connects through web service interfaces to various geospatial resources such as those hosted by ISU GIS TReC or Esri landscape analysis services. NASA's RECOVER Server stages site-specific data layers to the server instance. (3) These staged products are refreshed as needed to maintain coverage and currency throughout the fire. (4) The decision support products and the RECOVER web map client are ready for use by the burned area emergency response (BAER) team in minutes. With funding from the NASA Applied Sciences Program, Weber and Schnase partnered with the Bureau of Land Management (BLM) and Idaho Department of Lands (IDL) to test their vision. Mark Carroll, Roger Gill, and Molly E. Brown of NASA also worked on the project. RECOVER is the realization of this vision. 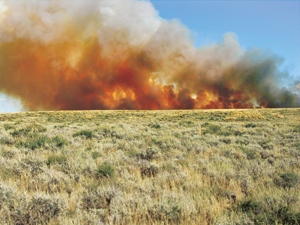 It is an automated burned area emergency response (BAER) decision support system for post-fire rehabilitation management across the western United States. By the end of the 2013 fire season, RECOVER had been used successfully on major wildfires that included the 2 ½ Mile, Mabey, Pony, State Line, Incendiary Creek, and Ridgetop fires. This test laid the foundation for a broader operational deployment of RECOVER throughout the western United States. The key to RECOVER's success is its rapid response capabilities. These capabilities are enabled by well-prepared statewide geospatial datasets, web services, and NASA's cloud-based data management technologies. The RECOVER system is made up of a RECOVER Server and a RECOVER Client. The RECOVER Server is a specialized Integrated Rule-Oriented Data System (iRODS) data grid server deployed in the Amazon Elastic Compute Cloud (EC2). 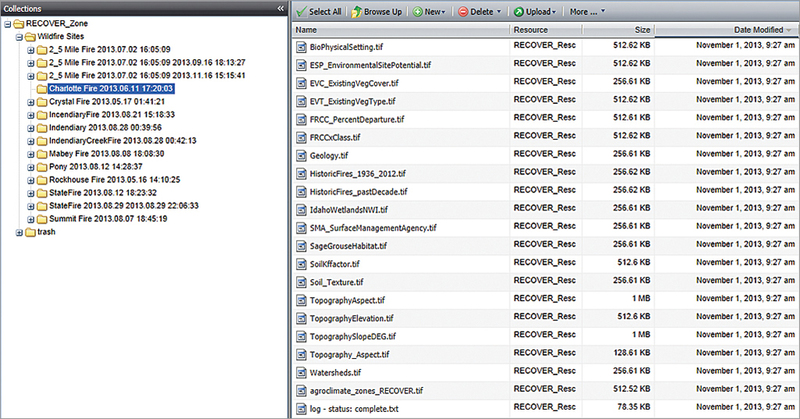 The RECOVER Client is full featured and was initially prototyped using ArcGIS Viewer for Flex. It was then migrated and customized using ArcGIS API for Flex in the Adobe Flex programming environment. RECOVER currently uses version 3.2 of the API. When provided with a wildfire name and geospatial extent, the RECOVER Server aggregates site-specific data from predesignated, geographically distributed data archives and performs the transformations and reprojections necessary so that the data can be used by the RECOVER Client. It exposes the tailored collection of site-specific data to the RECOVER Client through web services residing on the server. This automatic aggregation can take place in a matter of minutes. During the 2013 fire season, the RECOVER team learned of Esri's Landscape Analysis System, a project that in many ways shared a common vision of making critical landscape layers readily available via web services. Esri's Landscape Analysis System was developed in response to the needs of land managers working in government, academia, nonprofits, and industry. Esri consulted with these professionals and found that while their work varies greatly, they have core needs. They need efficient data access, consistent and compatible data formats, and tools that simply help them do their jobs. The RECOVER Server and Client interfaces are designed to be intuitive, fast, and easy to use. In traditional landscape analysis, many hours are dedicated to locating, obtaining, preprocessing, storing, and maintaining geospatial data. 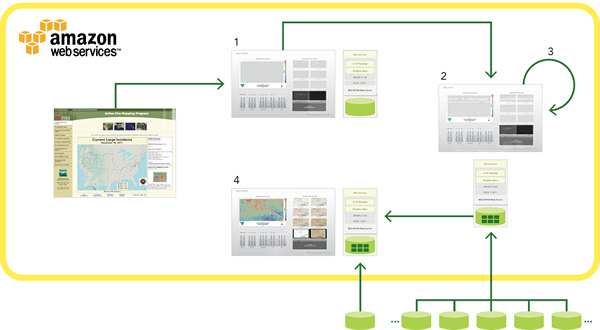 Web services, like those offered by RECOVER and the Landscape Analysis System, lessen the time required for these activities by offering single point of access to much of the necessary data from trusted sources such as NASA, BLM, US Geological Survey (USGS), and Natural Resources Conservation Service (NRCS). These datasets are generally offered as map services (vector data) and image services (raster data). Map services providing access to these datasets open up enormous potential by enabling applications such as the RECOVER web mapping client, mobile smartphone and tablet decision support tools, the ArcGIS ArcToolbox suite of geospatial analysis tools, and user-constructed geoprocessing models. 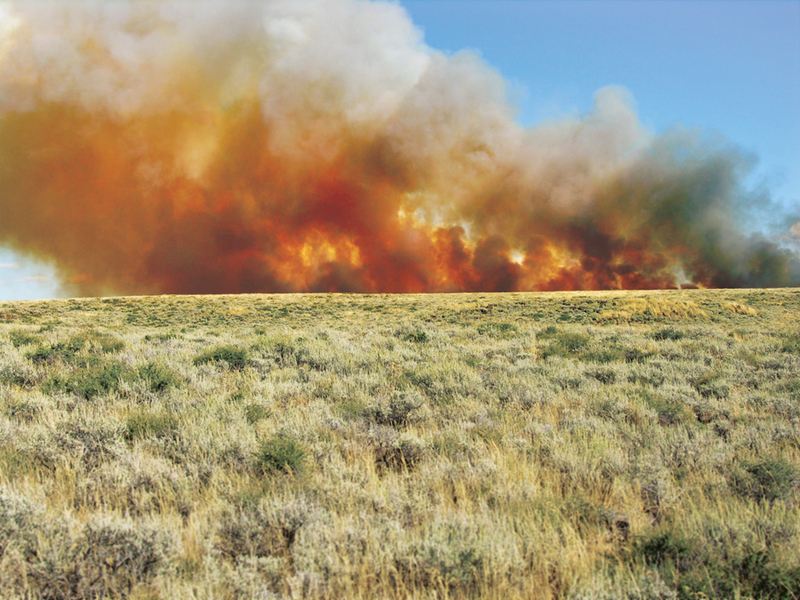 These capabilities are useful to postfire planning as well as land-use planning, hazards assessment, wildlife corridor design, and conservation planning. RECOVER complements the Landscape Analysis System by providing improved spatial resolution and a host of temporally rich satellite imagery libraries for long-term monitoring. RECOVER data, as well as Web Coverage Service (WCS) and Web Map Service (WMS) services made available from the ISU GIS Training and Research Center (GIS TReC), can be found in the Landscape for Contributors group on ArcGIS Online (esriurl.com/L4C), which is a part of the Landscape Analysis System reserved for data providers who want to contribute directly to the system and update and curate the data themselves. Not many years ago, RECOVER would have been a pipedream. Web services and cloud servers were in their infancy. Today, these technologies can empower better informed decisions. The success of this and other similar solutions depends on the rapid response capability enabled by cloud-based web services. RECOVER has reduced the time needed to acquire all the necessary geospatial data and even some summary reports to minutes. This data is abundant, current, and highly spatially resolved. This will allow for a better informed decision on the part of the land manager. Because RECOVER is web based, the land manager and the hydrologists, soils specialists, state supervisors, and other agency people involved in the fire recovery efforts can view and share data in real time. This benefits meetings, planning sessions, and long-term monitoring reviews, ultimately saving not only money but also time. For more information about the RECOVER project, visit giscenter.isu.edu/research/Techpg/nasa_RECOVER or contact Keith T. Weber, GIS director, GIS Training and Research Center, Idaho State University, or Pete Aniello, technical manager for Esri Database Services. Keith T. Weber is the GIS director at Idaho State University and principal investigator on the RECOVER project. He has a master's degree from the University of Montana, and his research interests include GIScience, object-relational database design, web services, and CyberGIS.